All microprocessor companies struggle with the same basic marketing problem: how do you explain to the average consumer why one part is faster than another without saying cache, GHz or cores. Intel and AMD have been using model numbers to abstract hardware differences for years. Today Qualcomm is announcing its own attempt at the same. 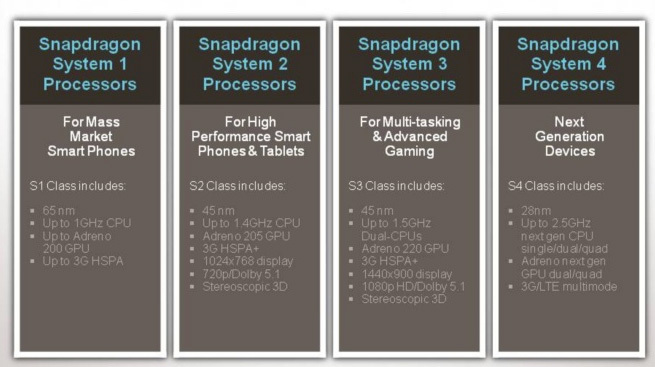 Snapdragon will continue to refer to Qualcomm’s family of high performance apps processors. Although in the past we’ve known them by relatively obscure seven character model numbers (e.g. MSM8660), going forward these SoCs are going to be grouped into one of four categories: S1, S2, S3 and S4. The rules are pretty simple. Bigger numbers mean better SoCs, smaller numbers mean cheaper/lower power. 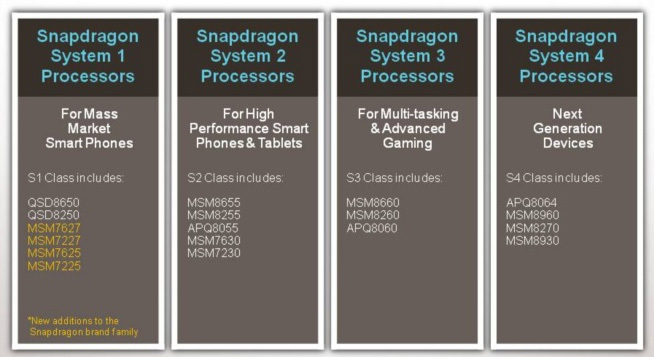 The full name will be something like Snapdragon S1 Mobile Processor, although it’s unclear whether or not we’ll see a model number attached to the end of that. The Snapdragon S1 is the mainstream 65nm SoC we’ve been seeing for the past year and a half: single core, Adreno 200 GPU, not a lot of fun but great for free/value phones. The S2 is the 45nm Snapdragon used in modern single-core Android smartphones. The S3 and S4 are the most interesting. The former encompasses Qualcomm’s move to dual-core SoCs, while the latter uses its next-generation Krait microarchitecture. Although S1 - S3 SoCs are available today, Qualcomm won’t be shipping Snapdragon S4 processors until the end of 2011. 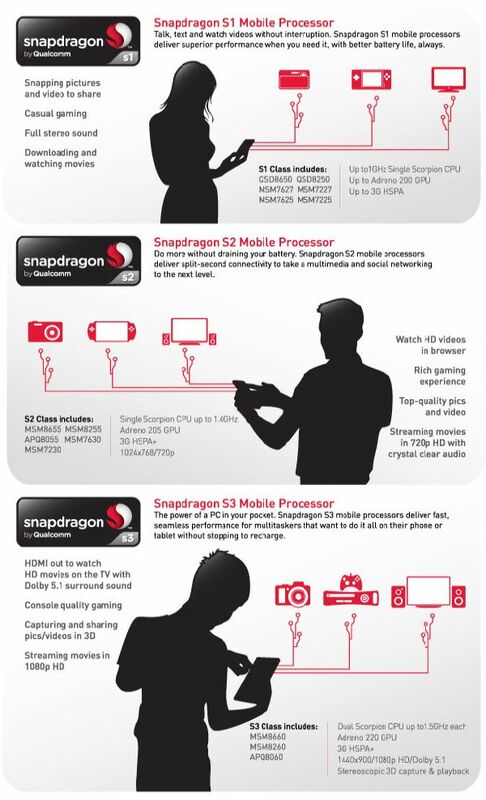 Devices built around Snapdragon S4 processors will appear in 2012. The branding change makes sense for Qualcomm. Prior to the S1 - S4 naming you either had people calling everything a Snapdragon or had to worry about explaining the difference between an APQ8060 and MSM8660. The new branding helps segment things a bit although I do believe Qualcomm will need to follow AMD/Intel’s lead and introduce some sort of a model number to indicate performance differences between parts within a family. Well, I'll never understand the technology-companies and their tons of little differences. Why isn't there a simple lineup like "low-end", "mid-range" and "high-end"? And by that I mean a maximum of 3 processors in the companies line-up and not dozens of low, mid and high-end parts. Everyone does it, and it applies to GPUs, CPUs or whatever. It makes the market totally oversaturated and for the end-consumer it's a jungle they feel lost in. Look at the car-industry. Most have very simple lineups basically, like BMW 1/3/5/7, but then they'll end up with the same crap because you can choose between 5 or more motors for each one of them, forget about the extras and/or preconfigured editions. """Why isn't there a simple lineup like "low-end", "mid-range" and "high-end"? And by that I mean a maximum of 3 processors in the companies line-up and not dozens of low, mid and high-end parts.""" If silicon manufacturers did that, they'd lose the benefit of binning parts that aren't up to the highest performance spec, and would thus have to throw quite a few more dies away. Chips aren't cars - you don't know what clock speed or how many functioning cores you'll get out of them until you've tested each and every one. I like my options. If you don't want choice, buy from Apple. "The new iPhone 5...Now 23% more magical!" > "The new iPhone 5...Now 23% more magical!" What an odd idea. It sounds like you've been listening to too much Apple cheerleading.